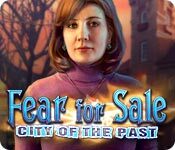 Fear for Sale: Mystery of McInroy Manor is a hidden object puzzle adventure game. It is about a family that through misfortune and some mysterious events has left the McInroy estate haunted. The player takes the role of Emma Roberts a press reporter. The estate has been locked and inaccessible for many years leaving only speculation to what really happened. Emma’s editor decides to provide a significant donation to the estate in return for access to explore the estate for a story. Now with access approval to the estate Emma hopes she can unlock the mysteries once and for all. The game style is one of hidden object puzzle adventure with hidden object search elements scenes that help key plot event sequences or yield needed items to assist the player for puzzle solution or story progression. Hidden object scenes are traditional with word objects at the bottom of the screen to be found in the scene above. Logic puzzles which must be solved are also sprinkled throughout the game to enable story advancement.